AeroCFD for Mac OS-X (version 2) is a computer program that uses Apple's Xcode 7 IDE and C++ to compute drag coefficient (Cd) as a function of Mach number up to Mach 10 and flight characteristics for single stage rockets in a suite of three programs called, 1) AeroCFD MacOS, 2) AeroCFD MacOS Plot and 3) Rocket Analysis. 1) Tool tip description for each input variable. 2) Determine drag coefficient (Cd) verses velocity to Mach 10. Where, V = Mn * a, and a is the speed of sound. 3) Display Cd at a specified velocity and plot Cd verses Mach number to Mach 10 using AeroCFD MacOS Plot. 4) Display input data and all drag components at a specified Mach number using AeroCFD MacOS Plot. 5) Determine velocity change (dV), maximum altitude, propellant mass flow rate and exhaust velocity knowing rocket thrust, specific impulse, initial mass, final mass, average rocket Cd and maximum airframe diameter using Rocket Analysis. Rocket Analysis uses a modified rocket equation that includes aerodynamic drag to estimate rocket velocity and peak altitude. Flight analysis results reduce to classical rocket equation results by inserting Cd equal to zero. Figure-1, Model rocket Cd verses Velocity (V = Mn * a) analysis, actual size. Where speed of sound = a. 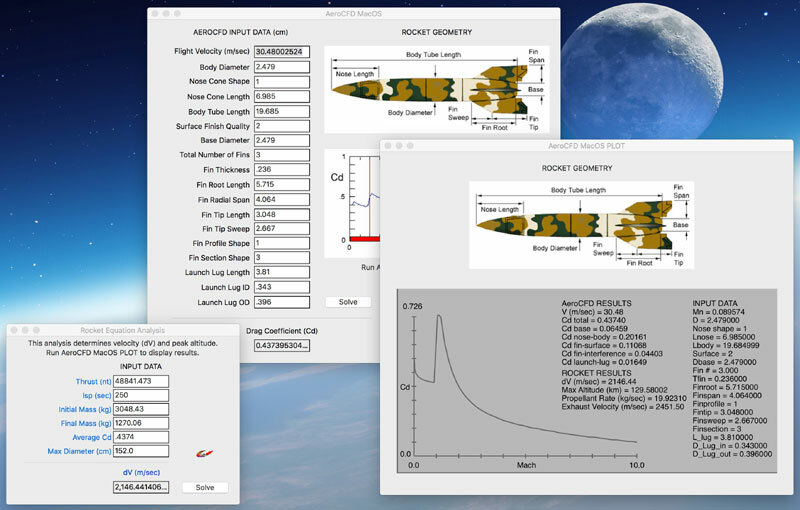 Determine drag coefficient (Cd) verses velocity for single stage rockets by inserting flight velocity in the first text box on the main screen and clicking tab. Insert all the required design information after clicking tab to advance to the next text box until all the rocket design information is specified. When data in the final text box is specified click Solve to display the drag coefficient (Cd) for the rocket at the specified flight velocity. The results illustrated in Figure-1 display Cd verses Mach number for a typical rocket. Figure-2, Results from Figure-1 and SpaceShipOne (SS1) flight analysis, Screen shot not actual size on an iMac computer. Rocket Analysis determines maximum velocity (m/sec) and maximum altitude (km) for single stage suborbital rockets. Insert Rocket Thrust (nt), Isp (sec), Initial Mass (kg), Final Mass (kg), Average Rocket Cd, and Maximum Diameter (cm). Run AeroCFD MacOS Plot to display Maximum altitude (km), Propellant mass flow rate (kg/sec) and Exhaust velocity (m/sec). The rocket results illustrated in Figure-2 display flight information for the SpaceShipOne.